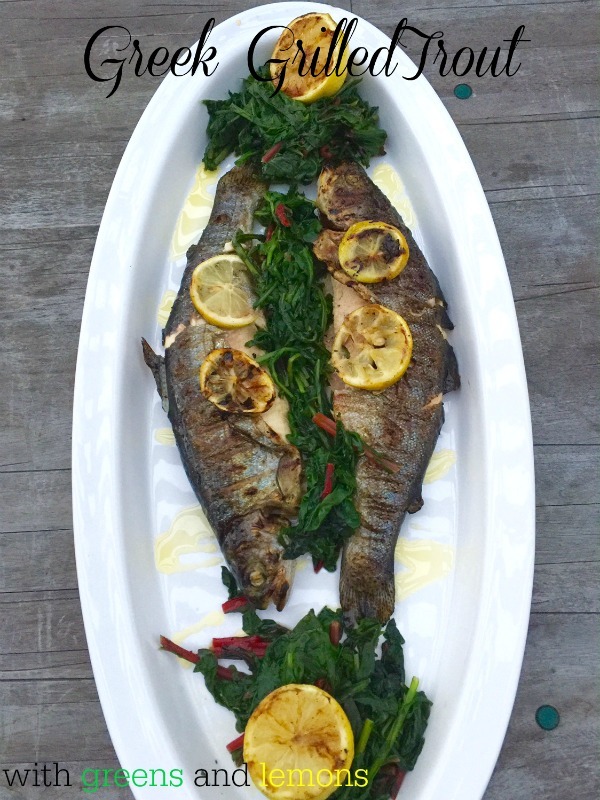 Living in San Diego, the perfect summer dish is grilled whole fish with lemon and olive oil, served with greens. This is one dish I crave from my visits to Greece. If your fish is fresh, there’s no need for more than that. It’s that simple. This hardly calls for a recipe, but if you want to make a dressing for the fish, look up my Ladolemono sauce. Use on fish, chicken or meat dishes and use to broil or BBQ. 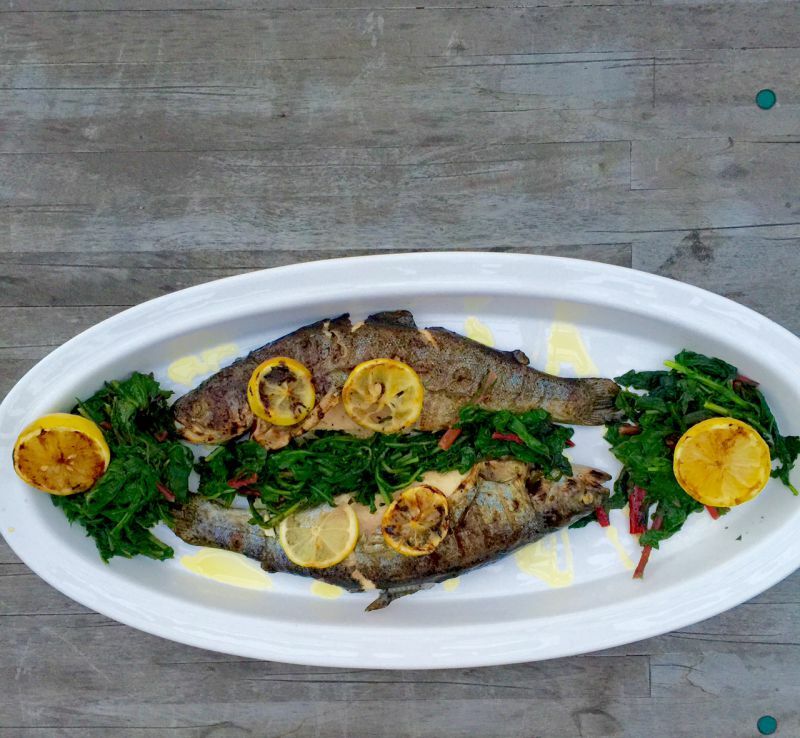 Grilling whole fish with bones keeps the flesh moist and flavorful. My mother and her family would shop down by the pier for fresh fish after church many Sundays here in San Diego. The fishermen would show up with their local catch of the day, which made it easy in selecting your dinner for that night. We would then take it home and simply prepare it with this sauce or even with just our pantry ingredients. Try and but only local fresh seafood in your area. Use the Seafood Watch website when selecting your fish. Download their Seafood App Here and take it with you to the market. Look for bright clear eyes on the fish. Look at the fish, does it shine? Does it look clean? It is dull, discolored? If so, don’t buy it. Smell it. A fish should smell like clean water, or briny ocean water. Don’t buy a smelly fish. Look at the gills. They should be bright red. Visiting Greece was such a treat in the summertime because the weather insisted you eat out late in the evenings. After a very warm day, appetites were growing once the heat was gone and the cool evenings arrived. Down by the beaches the fishermen would pull up and offer their catch of the day. All the nearby the fishing villages, provided outdoor seating in which they would BBQ up your selection of seafood. Served with greens or a salad this meal is what we all craved for as we traveled Greece. 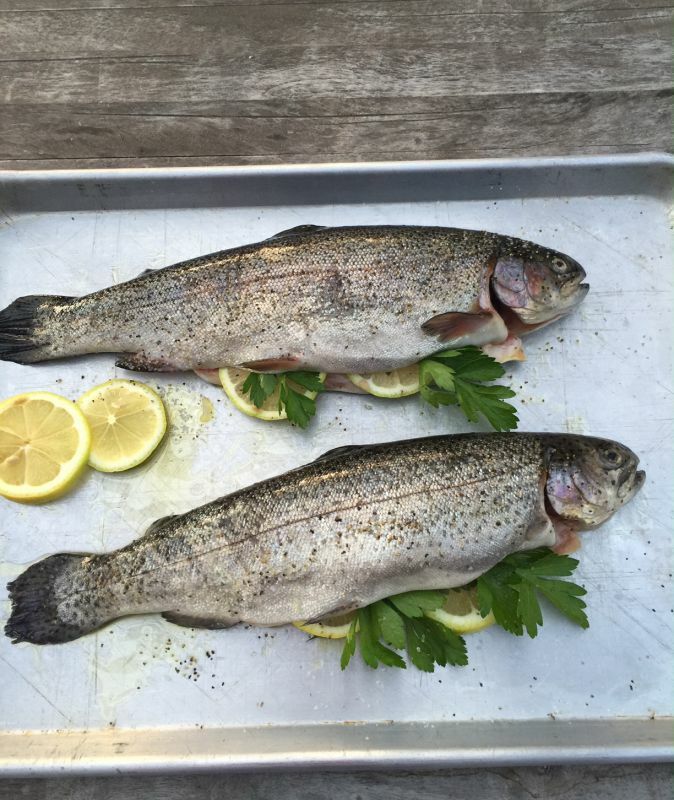 Make sure you oil the fish before placing them on a pre-heated, oiled, medium high grill. Watch the fish for it only takes a few minutes on each side. 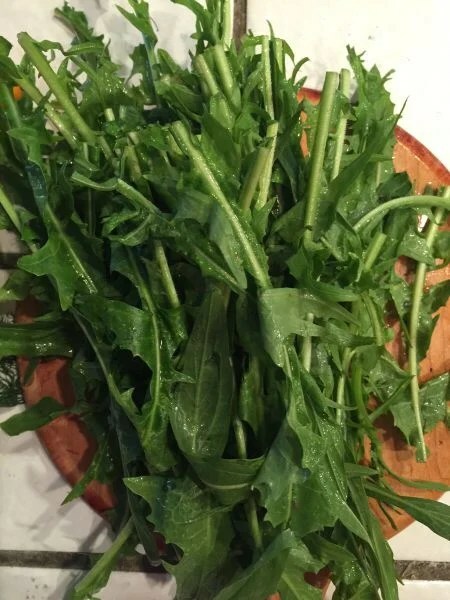 You can use any greens, here I used both swiss chard and dandelions. Other choices may be spinach, baby kale, mustard greens. One of my favorite summer dishes is grilled fish on the BBQ. This doesn't call for a recipe , but take a look at the simple ingredients that I used and you decide. This is the perfect summer BBQ meal. I suggest you prepare the greens while the fish is cooking. Finish them off once the fish is resting. Lightly brush the fish with the olive oil on both sides. Stuff the fish with thinly sliced lemons and sprigs of parsley or dill. Squeeze 1-2 lemons on the fish. Place on an oiled medium-heat grill and cook for 10 minutes and cover. Turn and cover again for 10 minutes, or until flesh is opaque, and the skin is lightly charred. Carefully, lift the fish with one or two spatulas and onto the platter. Cover to keep warm. When ready to serve sprinkle with olive oil and fresh lemon juice. 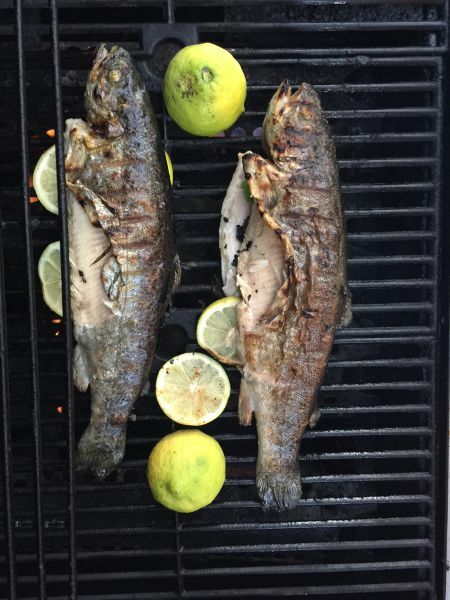 I placed a few halved lemons on the BBQ, to serve alongside the fish. Trim the stems of the tough greens and wash thoroughly. Place the greens in a large pot , add cold water and ½ teaspoon salt and bring to a boil. Reduce the heat and simmer until the greens are tender. Drain and place in a bowl. 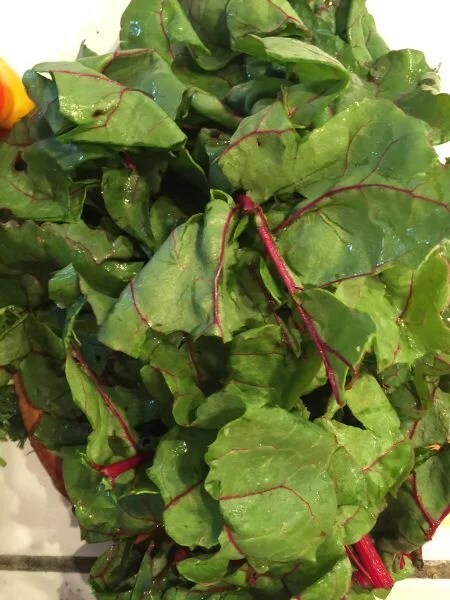 Finish the greens with a sprinkle with olive oil, fresh lemon juice and salt and pepper. Presentation is everything! Find a large platter and place the fish alongside the greens. Add the charred lemons and enjoy. 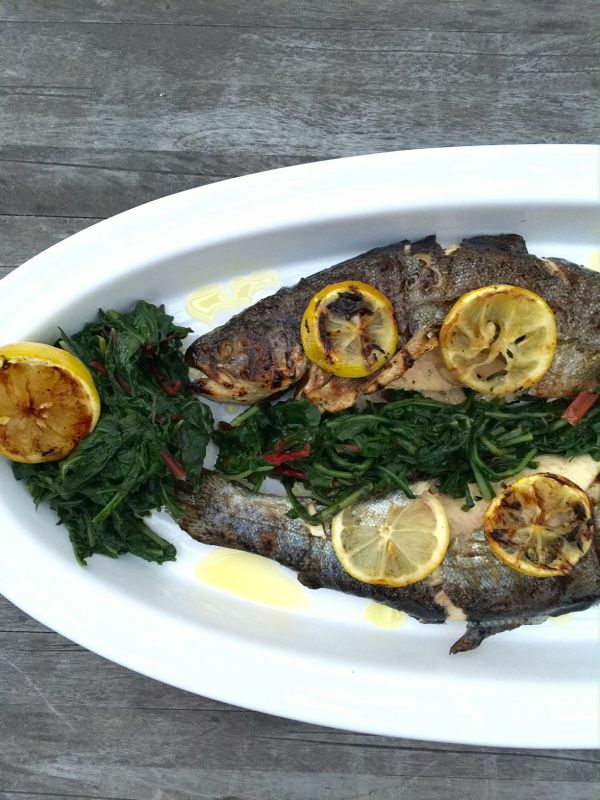 Beautiful post, especially with the link for sustainable seafood.